NEW YORK, USA, Mar. 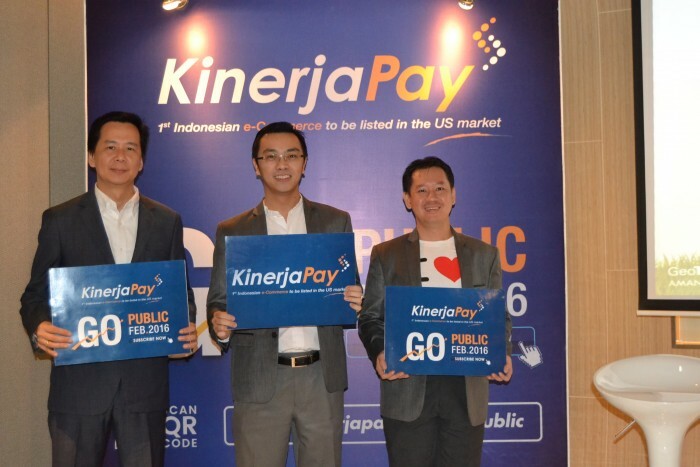 02, 2016 -- KinerjaPay, an online eWallet Company from Indonesia (OTCQB: KPAY), announced to GO Public in the US. With the growing number of internet users and social media in Indonesia has resulted in a snowball effect that is also profitable for many. According to Research DS Annual Startup Report 2015, the growth of e-commerce in Indonesia was the largest in the world, reaching 45% in 2014 and 37% growth in 2015. As one of the e-commerce platforms originated from Indonesia, KinerjaPay has become a popular consumers choice. KinerjaPay was launched by PT. Kinerja Indonesia that provides various IT services to Indonesia market. PT. Kinerja Indonesia has been providing IT services and Communications since 2007. Until today, KinerjaPay has attracted more than 13,000 active users and been a home to more than 10,000 products sold online since its inception in February 2015. Furthermore, KinerjaPay is now ready to GO Public in American Stock Exchange called OTC Markets (OTC.QB Board). This step has made KinerjaPay to become the first ever eCommerce Company to be listed at American Stock Exchange.